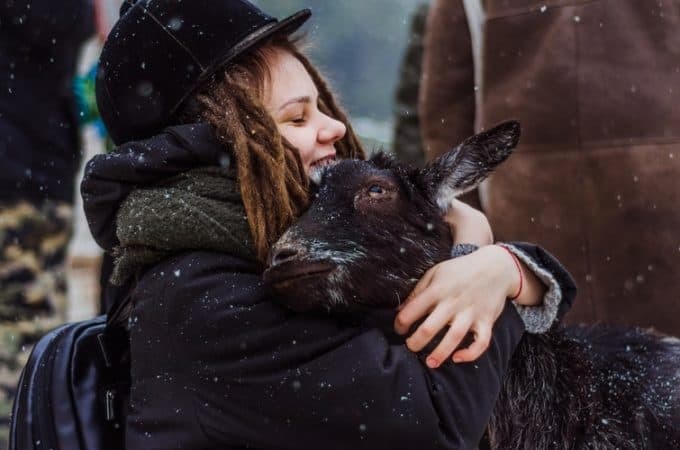 This is how to care goats in the winter season. A complete winter goat care guide including proper sheltering and feeding tips. In the cold winter season, your goats will need a warm house, edible hot water. In this time they will live on grains foods, hay, and additional proteins. Now let me describe how you will maintain and ensure the excellent care for your goats. This animal can tolerate cold but can’t tolerate cold breeze and moist weather. The first step that you should take, is providing a warm and comfortable shelter. Then focus on feeds and water. This will ensure good growth even in snow areas. But, this can be harmful to adults goats. Sometime they will get fat. Which results in low bathing rate, and lazy bulks. The primary concern when you building a shelter will, providing them with a strong, warm, and comfortable place. Each goat will need 3-5 meters of space, at least 4 hours of sunlight. Provide enough space (7ft-10ft) for each animal, ensure a warm floor and do not let the breeze or cold wild in the shelter. The air inside the house may get heavy to breathe, make sure that it will have a closeable window to provide fresh air and sunlight in suitable climate in a day. The floor should be easily cleanable. If the floor is slippery and hard it may cause accidents. So, if you lay hay on the base, then it will prevent those accidents and also provide a comfortable bed for them. Hay is the most suitable food for them. You can also supply grain foods. But, at this time green foods are not available. Which occurs lack of several vitamins. So, it will be wise to provide supplements in a small ratio. We previously posted an article on goats feed list. Where we have mentioned what you should and should not feed. You can read List of Feeds in Winter. Goats like green natural foods. But in that time, it will be taff to provide greener feeds. Hay or straw is the single most used feed. So store the best quality hay for the worst time of a year. This is very simple and straightforward. The ultimate solutions are grains, salt block. Grains will ensure 10%-15% of proteins. The salt block will provide minerals. Note: Do not buy seep supplements of salt block. Although it looks similar, the amount of copper then seeps need will kill a goat. 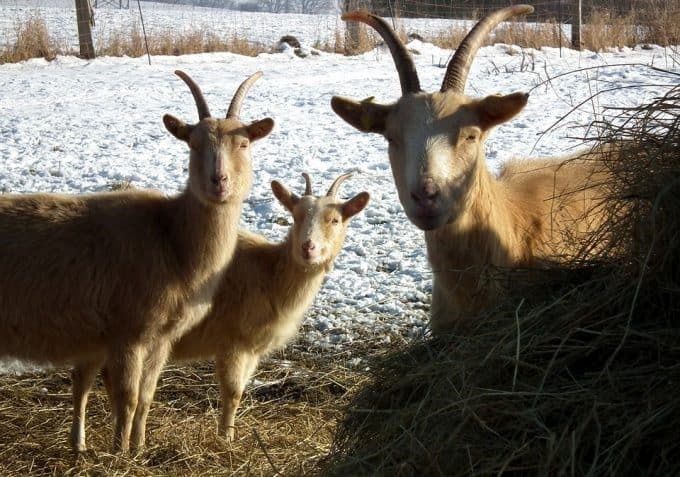 Each goat demands approximately three to four pounds of hay per day. Make sure that the feed has less than 18% of fiber. In the cold weather, goats can not pasture outside. By creating an isolated place, you can save the goats from cold. There is nothing too much tension. They grow up in cold weather. Temperate areas have particular species that can survive worst temperature. They can be observed in many hostile kinds of weather. You have to choose the race according to temperature. But, the kids do not have enough endurance to the cold. Because they can be easily infected with cold and cough diseases. To protect young goat is to take on them, cover them with a thick cloth. Although older animals can tolerate some cold, keeping them in those situations will not be wise. So put them in warm clothes. The wind cannot be allowed in the house where they will be kept. Have to wear warm clothes on them. Make sure that they will have the opportunity to heat the body in the sunlight. If that is not possible, then the temperature of the house should be controlled by lights or fireplace. If there is wind, it is better to not let the light of the sunlight through the window. Keep the kids away from the fire. If the floor is damp, the animals may break their bones. The floor should be cleaned twice every week. Always keep an eye on their health. If an animal becomes sick, keep him separate from the others. Goats love warm beds. Basically, it is easy. You can create such a comfortable resting and sleeping place using the straw and thick cloths. There are some advantages and disadvantages of haystack beds, such as the straw bed is much less costly but is lost its quality very quickly. The bed linen is a bit expensive. But it can be used again and again after drying under the sun. At last, if you are a beginner read 7 steps to start a goat farming. Leave a comment below! and share this if you find it helpful. Andre Lutforovich, founder member of Farming method -The modern Farmer's blog and one of the best farming expats. He completed his higher education in modern farming methods. Now, he is involved in various livestock business research. His hobby is gardening and blogging. I have been searching for winter goat care. Thanks. But i am new to goat farming. Here its cold most of the time. Can you suggest some cold area goats breeds? Guide? or something…. The drive immediately is lengthy, however incredibly scenic. Kyoto is the second historical capital cit oof Japan. Well Written! I was actually trying to find this.